Vista Print lets its customers relax wherever they are and send their artworks for printing via our online website or email & get it delivered free, you dont need to have the hassle of visiting us. After we recieve your file, We will inform you and send you the quatation. 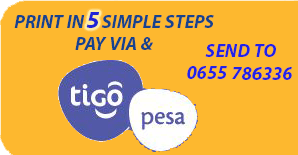 You will send us the payment via our TIGO PESA number (0655 786336). On receiving your payment, we shall inform you via Email, Call or Text and Start your printing immediately. A time frame will be given to you via mail, and then be delivered to you on time. Your Order Has Been Sent..! We will inform you and send you the quatation..